Eugene Katchalov Wins Event #5: $1,500 Seven Card Stud ($122,909)! Just five months after winning the $100,000 Super High Roller down at the PCA in the Bahamas, Eugene Katchalov has shipped his first World Series of Poker bracelet in Event #5: $1,500 Seven Card Stud. Katchalov entered heads-up played against Alessio Isaia as a massive underdog, with just 250,000 chips to Isaia's 1.35 million. The native Ukrainian came roaring back however, snatching the chip lead in under an hour and never looked back from there. Katchalov's good fortune was highlighted perfectly during the final hand, where he caught consecutive cards on sixth and seventh street to make a better two-pair than Isaia. 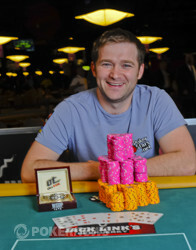 For his incredible comeback he takes home $122,909 and the coveted WSOP gold bracelet. Isaia's play cannot be overlooked for the past three days. 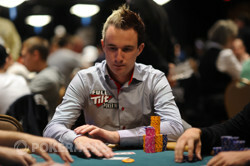 He entered today as the chip leader, and was among the leaders until the final table was set. There he fell in the ranks, but quickly turned it around and regained the chip lead. Unfortunately he couldn't close the deal against Katchalov heads up, and will have to settle with $75,911 for second place. Other players who deserve praise include Eric Buchman and Jonathan Spinks. 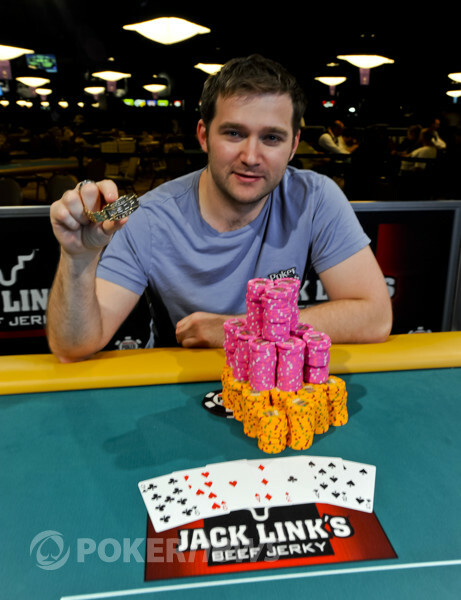 Spinks was severely card-dead throughout the day, but grinded all the way to 4th place, earning $35,476. Buchman was in cruise control at the final table, accumulating chips left and right until he began to slip. He failed to execute a handful of bluffs, and was crippled when Isaia made a wheel on sixth against his trip-queens. Buchman unhappily exited in third place, receiving $48,961 for his play. When heads up played started, Eugene Katchalov was at a 7 to 1 chip disadvantage. About two hours later, Katchalov is getting ready to put on his first WSOP bracelet. Alessio Isaia got the last of his chips in on third street, where he had king high. Katchalov showed ace high, and was in the lead to take down the tournament. Neither player improved on fourth street, but Isaia caught a pair of kings on fifth street. Katchalov paired his nines on sixth, but still needed to improve on the river. Katchalov squeezed his card, and showed the for aces up. Isaia did not improve, and he was eliminated from the tournament, taking home $75,911 for his second place showing. Eugene Katchalov will pocket $122, 909 for the win, and claims his first WSOP bracelet. Isaia brought it in, Katchalov completed, and Isaia called. Katchalov check-called a bet on fourth street, and both players checked on fifth. Isaia led out with two pair on sixth, and Katchalov called. On seventh Isaia slowed down, check-calling a bet from Katchalov. Katchalov tabled two black sevens for a better two-pair, and Isaia is left with only 30,000 chips. Play has resumed, and Alessio Isaia just joked, "I have him right where I want him." Just over an hour ago, Eugene Katchalov had even less chips than Isaia has now, so anything is possible. The only thing that is going to stop Eugene Katchalov is the break. The two players have taken a 20 minute break. After Alessio Isaia finally managed to put a dent in the armor of Eugene Katchalov, Katchalov went back to his dominating form. Katchalov brought in, then called when Isaia completed. From there, Isaia bet every single street, and Katchalov called every single street. Isaia confidently showed the for a pair of aces, but Katchalov showed for two pair. After that, Katchalov is back in a commanding lead. Katchalov Is Human After All? For the first time in over an hour, Alessio Isaia has finally won a pot at showdown against Eugene Katchalov. Isaia brought in, and Katchalov completed. Isaia called, then proceeded to call on fourth and fifth street. On sixth street, Isaia upped the aggression by raising, and Katchalov called. Katchalov check called seventh street, and in what has truly been a rare site heads up, Katchalov mucked when Isaia showed for trip deuces. Eugene Katchalov has chipped up over the past 45 minutes thanks to some good timing and great cards, but he won this hand on what was simply a sick read. Katchalov brought in, and as has been fairly standard throughout the heads up duel, Isaia completed. Katchalov called, then called down as Isaia bet on every single street. Katchalov must know something we don't because at showdown, Isaia revealed for just king high, and Katchalov showed for a pair of nines that was good enough to take the pot! Katchalov now holds nearly a 4 to 1 chip lead.